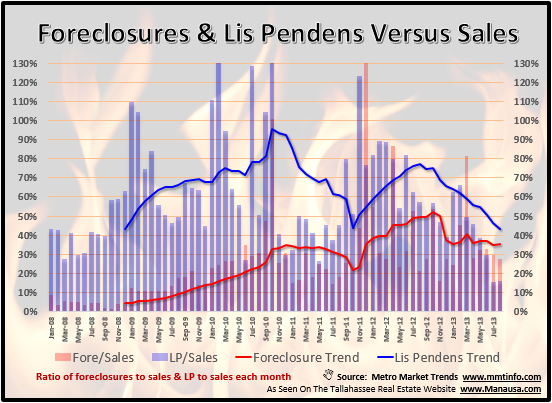 New lis pendens filings in Tallahassee rose 49% in July when compared to July 2013, while foreclosures fell 4%. The trend of declines in new lis pendens filings unfortunately turned this month, but the decline in foreclosures continues to be good. The large amount of lis pendens filed in the past must clear the market now as foreclosures. The blue line in the graph below shows that there are more foreclosure sales than lis pendens filings, meaning we are truly working through the distressed properties now and their numbers will soon be declining greatly. There is still way too much distressed property activity, but the latest market trends are positive.